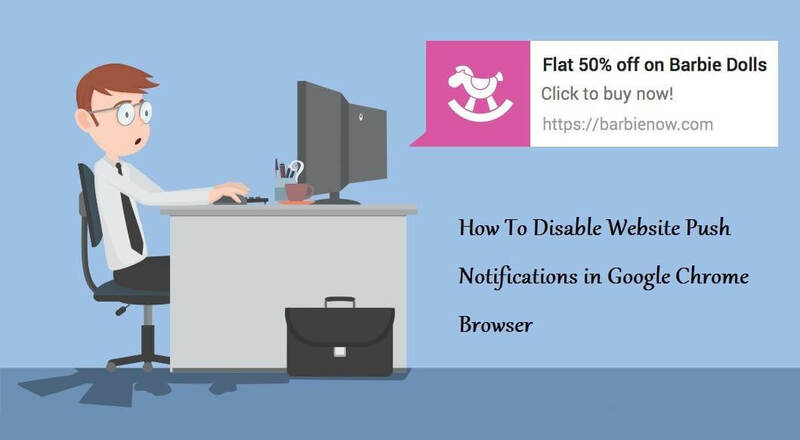 Hello Dear, Today we will learn about how to disable Website Push Notifications in Chrome Browser. Now, most of all small-scale websites show notifications from the help of browsers. Whenever you visit any news or shopping websites, you’ll see a popup on which this message show is “Website wants to show notifications on your desktop”, which allow or block it. If you allow this push notification, then this kind of agreement is between you and that particular website. That means, whenever any new articles will be published on that website, you will get a notification on the desktop and it will give you the benefit that you will not be missed Any updates to the website. As you know, there are 2 aspects of everything that is good and bad, yet what you read above is a good aspect of the desktop push notification. Now talk about its bad aspects due to which many users are disabled Web Push Notifications. The first problem with Website Push Notification is that whenever you open any such websites on which push notification is activated, your browser shows notifications every time you have to allow, block or close. Sometimes we allow push notifications due to our interest, and then you get the desktop notifications coming from that website, and now the reason for disabling Website Push Notifications is due to some reason. Things will end the interest in the subject or notifications of that website. Apart from this, some websites keep sending you advertisements and spam notifications in desktop notifications. Therefore sometimes it is very important to disable websites push notification. We will also learn how to disable push notification only on some websites. Step-1: First of all, open Google Chrome Browser then click on “setting menu” (three dots) in the top right corner, then click on the “Settings” option and click on the “advanced” option at the bottom of the settings page. Step-2: Now click on “Content Settings” in the Privacy section. Step-3: Now you will see a popup of content settings in front of you. In which you have to scroll down and go to the “Notifications” section And block it. Step-4: If you want to receive notifications of some websites and stop getting something off. You have to first click on “Ask when a site wants to show desktop notifications” in the “Notifications” section. After that, click on “Manage exceptions” You will now see a list of URLs for those websites whose fault notifications you accidentally allowed. From here you can remove those websites from the list by allowing and blocking the notifications of those websites. Note: Here are some websites (URLs) that Google has added to that list, you can not remove or block such URLs, and all those URLs are visible to you with italics (lightly diagonally). Step-1: Open the browser and click on the 3 Dots in the top right corner and tap Settings. Step-2: Tap on Site Settings in the Settings page. I hope you liked this “How To Disable Website Push Notification in Chrome Browser” Post. If you have any questions or suggestions related to this post, then comment below and share this post on social media with your friends.